Correction: An earlier version of this story incorrectly reported that Arkansas does not require reporting for E. coli O157. The CDC recommends each state track 20 categories of foodborne illness. Check how your state responds. “There are multistate outbreaks out there that we don’t recognize and we don’t know about,” said Dr. Tim Jones, state epidemiologist for the Tennessee Department of Health. National outbreak surveillance depends on the collaboration of 2,800 state and local health departments subject to at least 50 different reporting requirements. Though PulseNet can identify local outbreaks, the network specializes in discovering widespread outbreaks associated with “industrial contamination events,” where the food is infected in the supply chain before reaching grocery stores and restaurants, said Dr. Ian Williams, chief of the CDC’s outbreak response and prevention branch. These outbreaks often result in a handful of reported cases in multiple states. Without PulseNet connecting the dots, epidemiologists have few leads to investigate the source of illness. In eight states, health departments must be notified immediately about cases of E. coli O157, one of the most virulent foodborne illnesses. 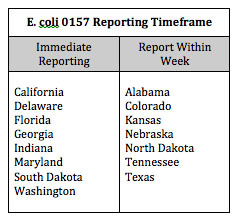 Seven states allow a week, the longest timeframe in the country, to submit the same report. 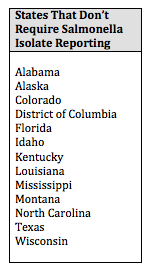 Though every state requires reporting for salmonella, 12 states and Washington, D.C., do not require the submission of isolates to the state public health laboratory. Texas reported the same results earlier that week — more than a month after its first cases in late May — taking more than twice the time to reach the same conclusion. On July 9, 2008 with evidence mounting, the CDC issued a nationwide alert advising consumers to avoid jalapeno and serrano peppers, following indications that tomatoes played a role early in the outbreak. With nearly 8 percent of the country’s population, Texas provided 5 percent of the nation’s salmonella surveillance through PulseNet between 2001 and 2007. Over that same time, Texas reported the fourth fewest salmonella outbreaks per 100,000 people, suggesting outbreaks went unidentified or unreported more frequently in Texas than in 46 other states. When it was over, the outbreak had sickened 1500 people in 43 states, Washington, D.C., and Canada, hospitalizing 308 and resulting in two deaths. Since 1998, the Florida Department of Health has received isolates for less than 20 percent of its cases, the lowest percentage in the country and less than half that of Nebraska — the state with the second lowest submission rate. Florida’s contribution to national salmonella outbreak surveillance accounts for less than a third of its population. Foodborne outbreaks are more likely to go undetected in states lacking those surveillance and response mechanisms. While most of them will be small, localized clusters of illness, some with the scope of the hot pepper outbreak will also slip through the cracks, said Tennessee’s Jones.